Based on the original Institute of Archaeology at Liverpool this is one of the oldest departments in Britain, with extensive museum and archive collections based on 100 years of research in the Near East, Egypt, Classical archaeology and human evolution. Currently offers a diverse selection of undergraduate and post graduate degree programes acorss the archaeological spectrum including many ancient languages. The School of Archaeology Classics and Egyptology at the University of Liverpool offers a unique range of degree programmes from the evolution of the human species, through the prehistory of Europe, to the ancient civilisations of Egypt, the Near East, Greece and Rome. There is no other University in the United Kingdom which gathers such a range of programmes within one single School or Department, allowing us to offer an unrivalled flexibility and range of choice within many of our programmes and also the opportunity to study archaeology, history, culture and ancient languages within a single degree programme. 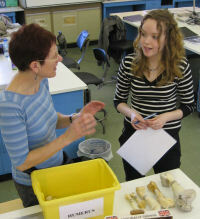 We welcome applications from anyone who has an interest in and the enthusiasm to explore human experience in antiquity. Rated 4th in the country for research quality, with specialisms in British archaeology, the classical worlds of Greece and Rome, Mesopotamia, Egypt and human origin and evolution. They have a brand new field school and the recently refurbished Garstang in-house Museum, which loans artefacts to Museums around the world. Liverpool is an internationally recognised centre for research in Archaeology, Classics and Egyptology with 40 members of staff and over 100 postgraduates working on 15 global research projects. Thanks for sharing, I love liverpool.